Recently we have been asked to review a website that has been around for several years but has just undergone a complete makeover . The main website being MyStartingPoint.com and is dedicated to the lifestyle and travels of the contributors. Like Event Traveller, the website covers all different areas and topics and has more articles than your average blog. Lifestyle website My Starting Point has been designed with the use of WordPress and Adobe Photoshop with many images being used from Pixabay. The idea of the website is to go through issues most important to the readers, and use the premise that every journey or project does have a start point. What do you think of the website and what are your views? We love the design and appreciate the theme used which allows all topics to be displayed in a pleasing way. The colours of the site, black and lime green also contrast well and the font used is great. 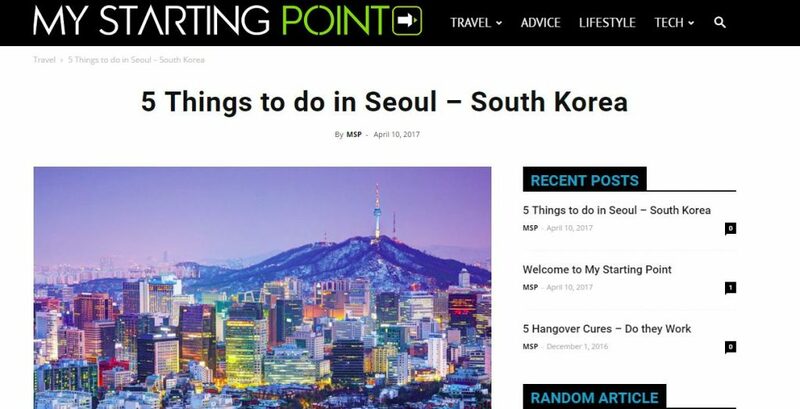 An outstanding article from My Starting Point is the recent 5 Things to do in South Korea which covers all the main attractions specific to Seoul. The website has 3 writers with guest bloggers often being allowed to give us insightful articles. Are there any other blogs which you recommend us to read? A female outlook on life which covers mainly female topics and is also contains great motivational articles including regaining motivation for females. As we have viewed from the blogs above, there are so many websites online now it is easier to find one that you like.We recommend using the RSS feeds and whilst they are a little outdated it is great to have all your articles listed in one place. Tip: We love to download the articles to read whilst on the move, the subway to work for example. There are great apps for your phone.